The rule which helped the All Blacks cling on for victory against England last November has been discreetly revised by World Rugby. Controversy erupted after New Zealand won that test 16-15 at Twickenham, as the hosts had a late try to Sam Underhill ruled out due to Courtney Lawes being ruled offside in charging down a TJ Perenara box kick. The governing body isn't meant to amend laws in a World Cup year, but described the rewording of this one as instead a "revision", as they look to avoid any sort of repeat confusion. The crucial tweaking, not formally announced by World Rugby, is that the offside line at a ruck will now not be based on positioning of the "hindmost foot", but rather the "hindmost point of any player from either team", for instance an arm or a head. When referee Jerome Garces, via TMO Marius Jonker, ruled out Underhill's try, many were left split over the decision. For starters, there was a grey area about whether it was actually a tackle or a ruck, then if it was considered the latter the law stated the offside line ran "through the ruck participants' hindmost foot", while the explanation had it being "the hindmost foot of the player of the same team". Under the first definition, the line would have been set by the foot of All Blacks prop Ofa Tuungafasi, and showed Lawes marginally offside. But under the second, Lawes could have been considered onside, because he was behind team-mate George Ford, who was on the ground after making the tackle. With World Rugby wanting offside to be a black and white decision, chief executive Brett Gosper proposed the rule tweak following the end-of-year internationals. "The chief executive came to the rugby committee and said, 'Can we look for a clarification in law?' It was trying to seek clarity of 'what is offside? What is the back foot of the ruck? Is it the foot or is it the hindmost part?' We had to take the word foot out." The changes are in place in readiness for the Six Nations, which kicks off next weekend. 4. Each team has an offside line that runs parallel to the goal line through the hindmost point of any ruck participant. If that point is on or behind the goal line, the offside line for that team is the goal line. At a ruck, the offside line runs through the hindmost point of the hindmost player of either team. The player in the yellow jersey on the right-hand side is offside. 4. Each team has an offside line that runs parallel to the goal line through the ruck participants’ hindmost foot. If that foot is on or behind the goal line, the offside line for that team is the goal line. A player on their feet from either team gains possession of the ball and moves away or passes or kicks the ball. The ball is unplayable. If there is doubt about which player did not conform to law, the referee orders a scrum. The throw is taken by the team moving forward prior to the stoppage or, if no team was moving forward, by the attacking team. Which was the case with Marius Jonker's ruling. As above peranara now has his hands on the ball, is Lawes offside??? Does not matter now though, score board tells it all, South African jonker disallowed the try to make amends for springboks loss to England. As somebody who only seriously watches Rugby during the world cup. There is always a drastic change to the rules between World Cups. It was a tackle, where law 14 applied as I posted in post #4. Lawes already stepped past Ford which was on the ground. 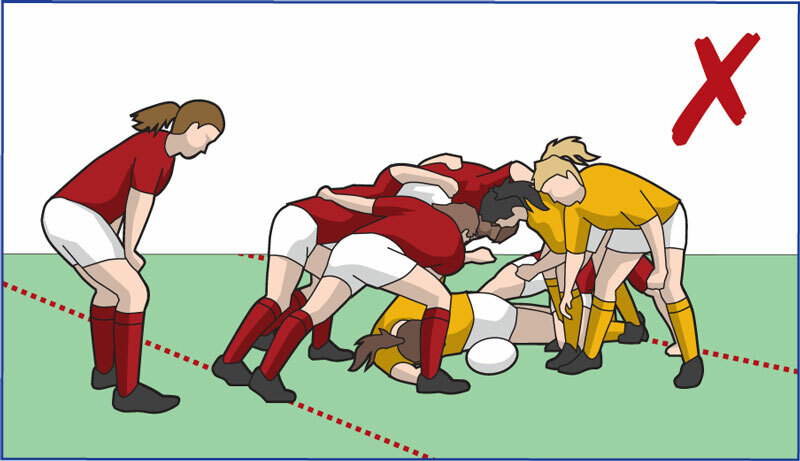 World Rugby made (by revision) this law to have the ruck parallel lines concur with the tackle parallel lines. It's good to remove the ambiguity, though.